The aftermath of the Le Mans disaster resulted in the cancellation of the French GP, which had been scheduled for July 3, and so the British Grand Prix became the sixth round of the World Championship. The race had always been held at Silverstone but for the 1955 season the Royal Automobile Club decided that the race would be held at the Aintree racecourse in the outskirts of Liverpool. The Mercedes-Benz team was the favorite for success but the Maserati 250Fs were competitive even if Ferrari was struggling. Vanwall, Gordini, Connaught and Cooper (with Jack Brabham making his World Championship debut) were all represented but Mercedes-Benz was dominant with Stirling Moss fastest by two-tenths from his team mate Juan-Manuel Fangio. 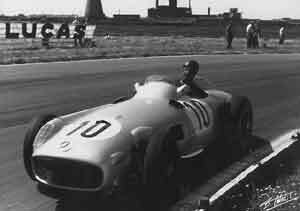 The Mercedes-Benz team was running four cars with third Karl Kling being joined by Piero Taruffi but both men were beaten in practice by Jean Behra's Maserati. The third row of the grid featured the Maseratis of Roberto Mieres and Andre Simon split by Harry Schell in the fastest Vanwall. The fastest of the Ferraris was that of Eugenio Castellotti in 10th position. Moss took the lead at the start but Fangio quickly moved ahead only to see Moss win back the position on lap 3. Behind the two Mercedes Behra fought back after a poor start to get ahead of Kling and Taruffi. Taruffi then dropped behind Mieres. Behra retired on lap 10 after an oil pipe broke while the two leaders switched places again: Fangio leading for a few laps and then Moss surging ahead again. The two continued to lap nose-to-tail for the rest of the afternoon but at the finish it was Moss who took the flag first - to the delight of the huge crowd. It has often been said that Fangio allowed Moss to win but Fangio never admitted to it.